Finned Tubes Brass,Copper-Nickel & Copper Tension wound finned tubes, embedded finned tubes, extruded finned and low finned tubes.Tension wound finned tubes are formed by winding a strip made of aluminum or copper around the tube under tension. 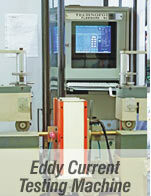 The strip winding technology provides different types of fins: L-fin, LL fin, KL fin. METALCO - with a production capacity of 6000 MT per annum sprawls across an area of 150,000 sq. ft. with a unique design of the constructed area of 60,000 sq. ft. which maximizes productivity & enables us to transfer benefits of the large scale operations to the customers. In order to consistently manufacture international quality products, the company has employed a dedicated team of highly qualified and experienced Engineers and Management Professionals.